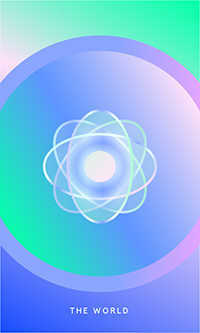 You are in a timeless state of grace where all is well. 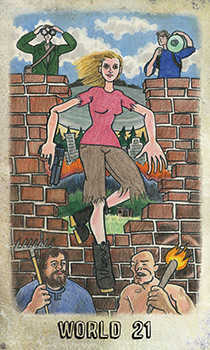 Vanessa deck © U.S. Games Systems, Inc. 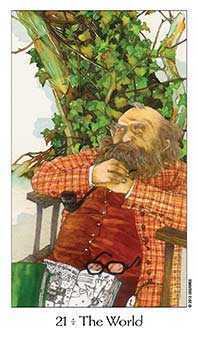 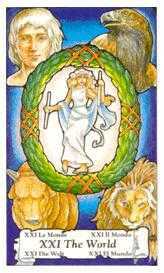 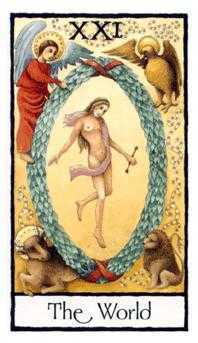 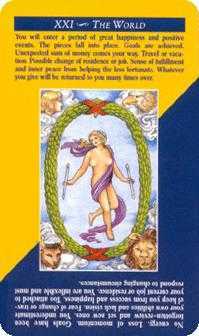 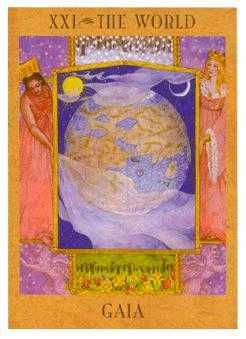 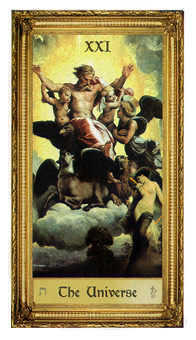 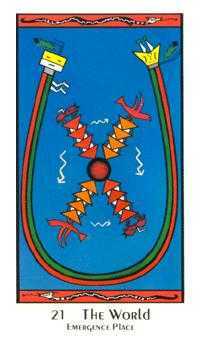 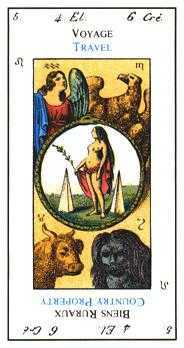 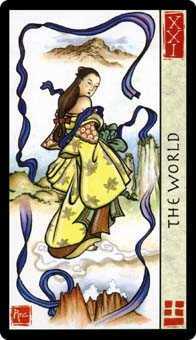 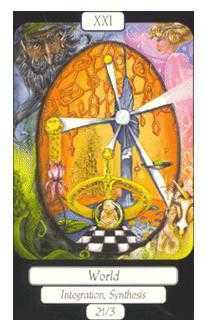 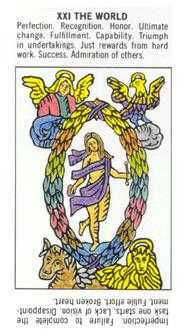 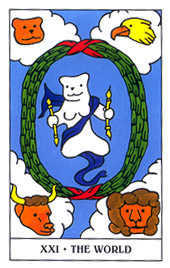 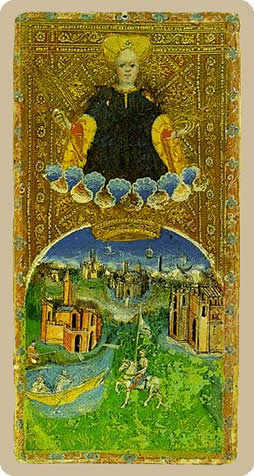 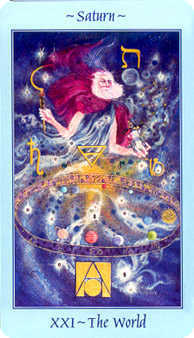 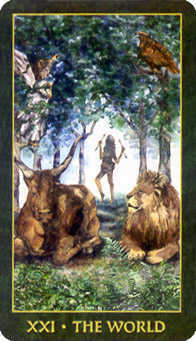 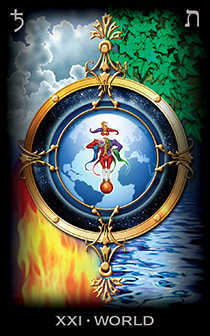 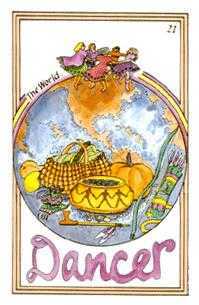 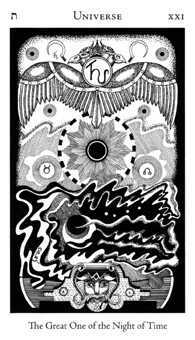 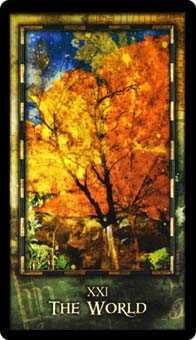 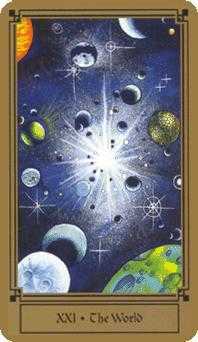 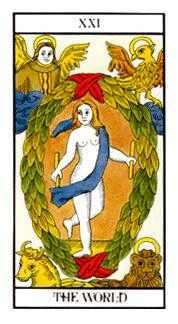 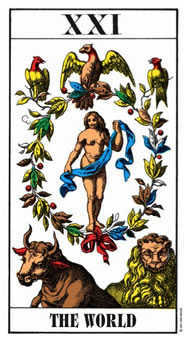 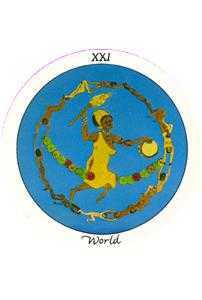 The World card points to the presiding wisdom which upholds life on this and all worlds. 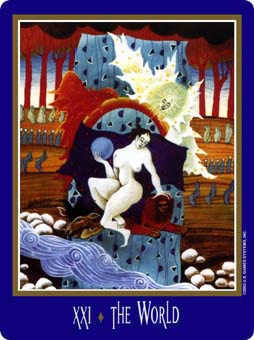 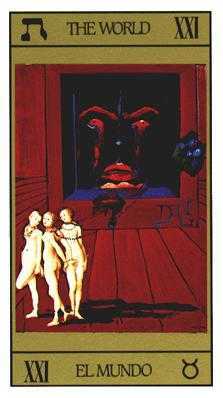 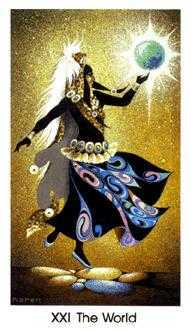 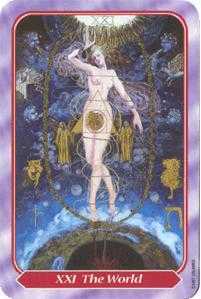 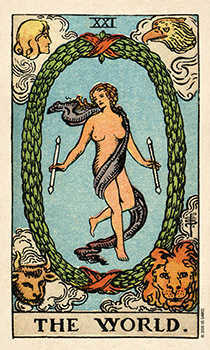 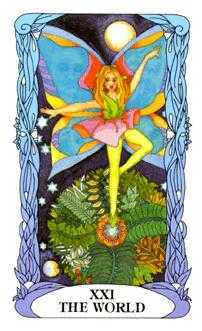 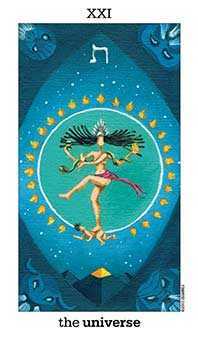 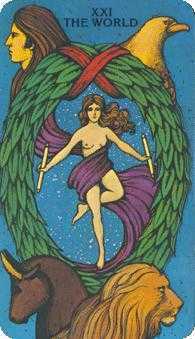 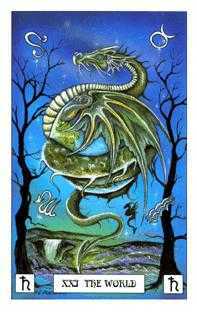 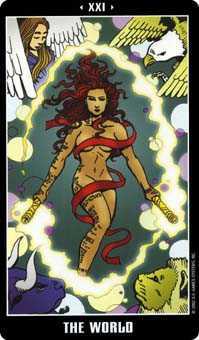 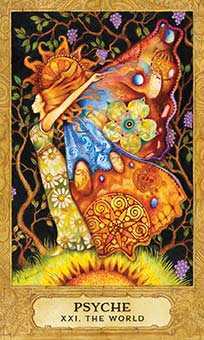 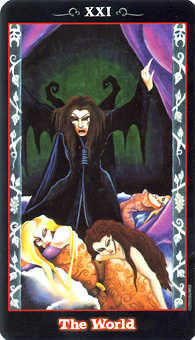 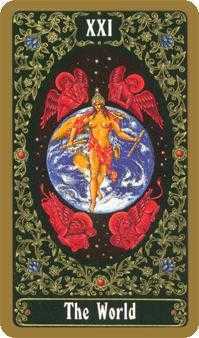 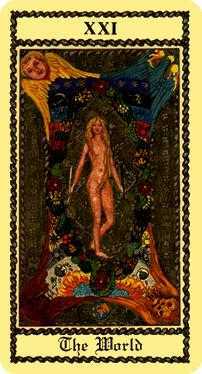 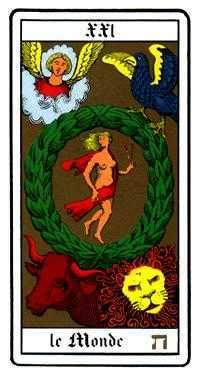 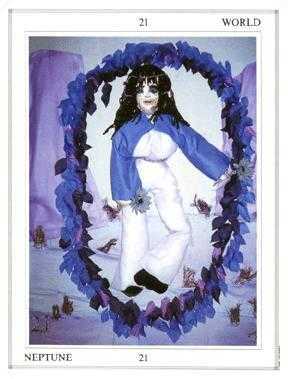 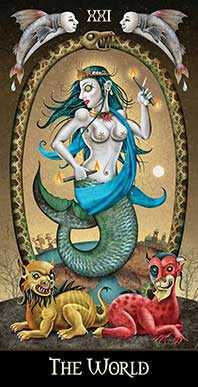 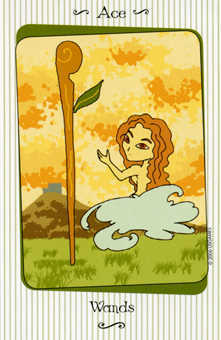 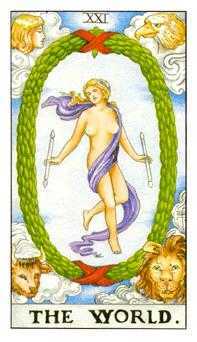 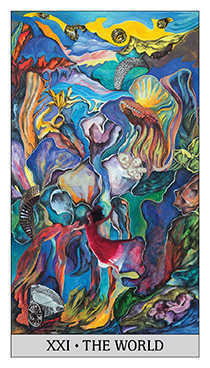 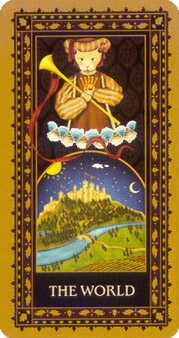 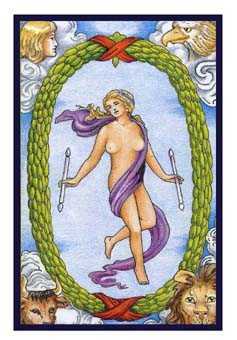 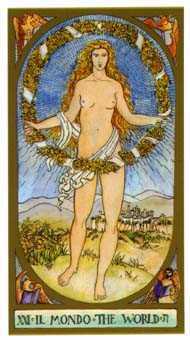 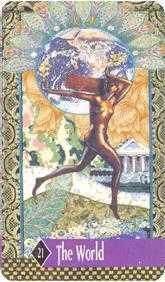 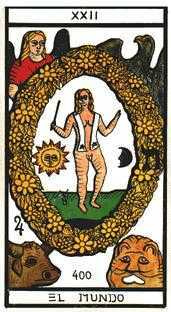 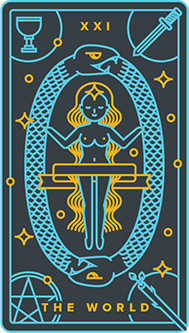 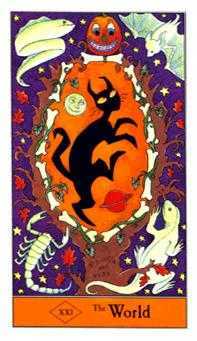 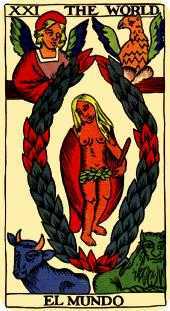 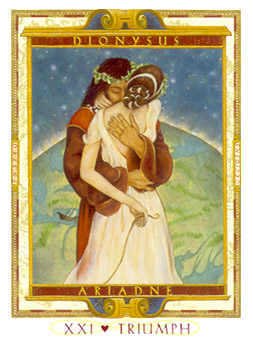 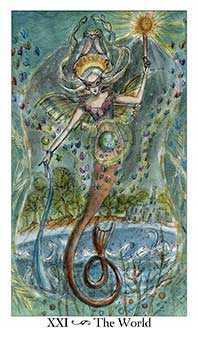 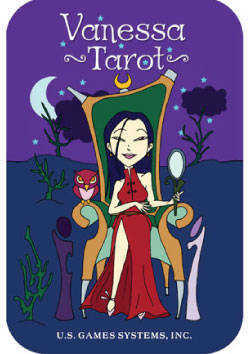 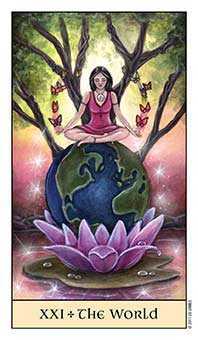 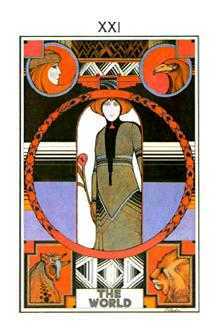 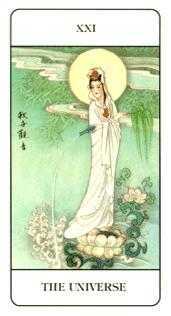 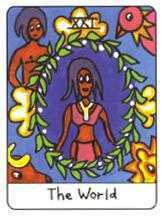 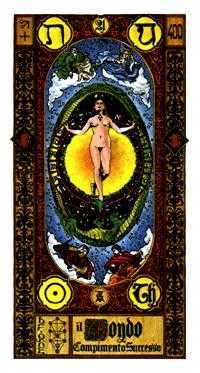 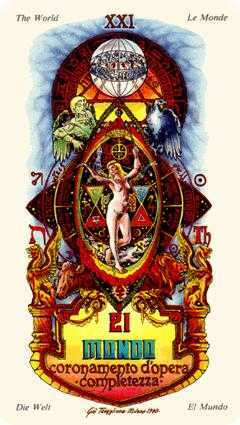 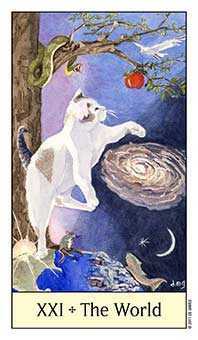 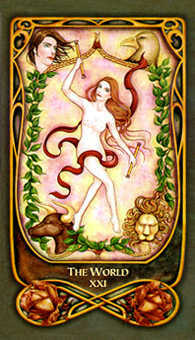 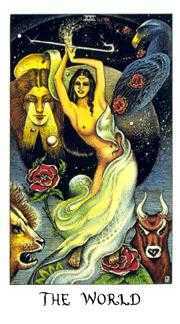 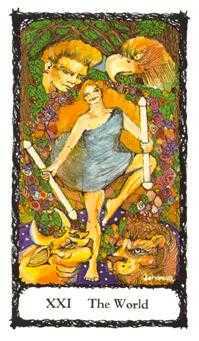 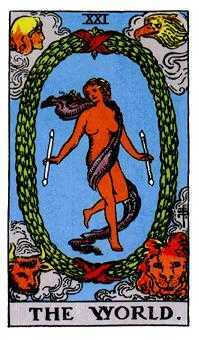 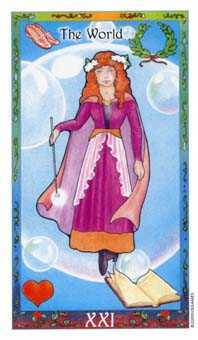 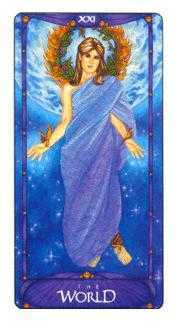 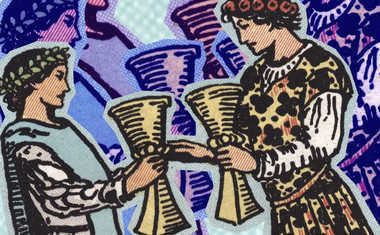 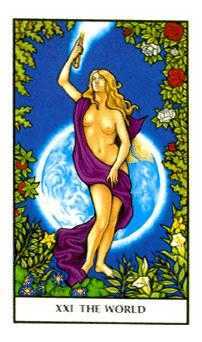 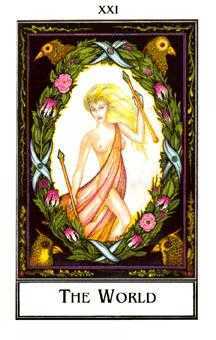 In most Tarot decks, it is a female figure that has become our standard World image. 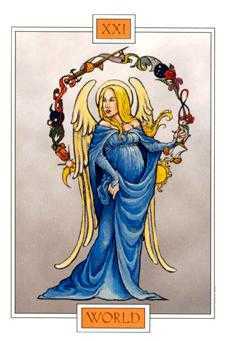 She originates in Hebrew, Gnostic, and Alchemical lore, and stands between heaven and Earth as the cosmic mother of souls, the wife of God, and our protector from the karmic forces we have set loose upon the Earth in our immaturity and ignorance. 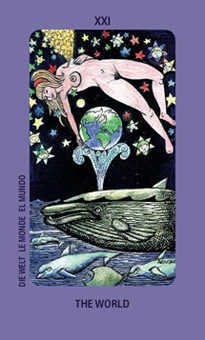 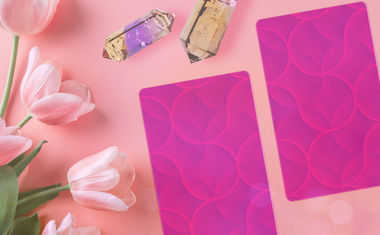 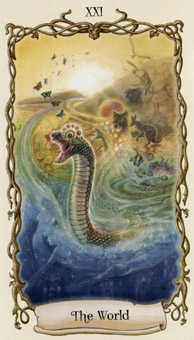 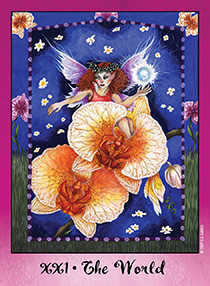 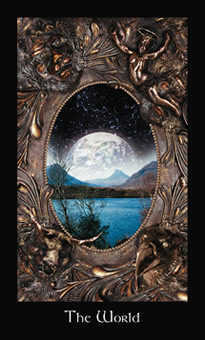 The goddess of The World card invites us into cosmic citizenship -- once we come to realize our soul's potential for it. 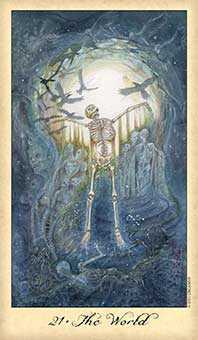 It announces the awakening of the soul's immortal being, accomplished without the necessity of dying. 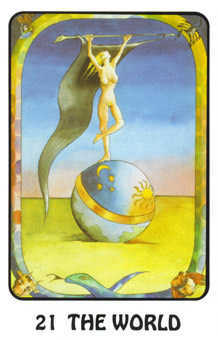 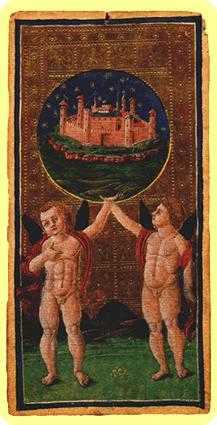 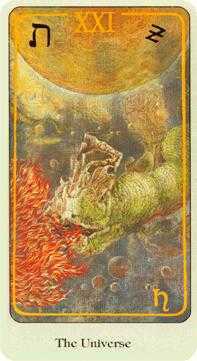 This card, like the Sun, is reputed to have no negative meaning no matter where or how it appears. 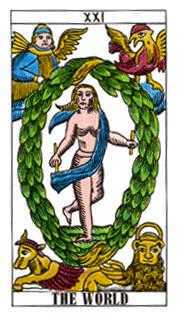 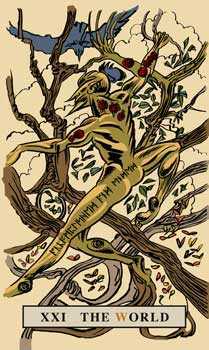 If the Hermetic axiom is "Know Thyself", this image represents what becomes known when the true nature of self is followed to creative freedom and its ultimate realization. 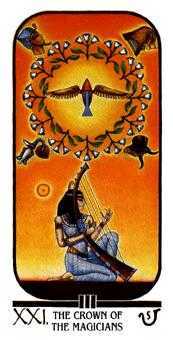 Be serene in knowing you are succeeding in your goal. 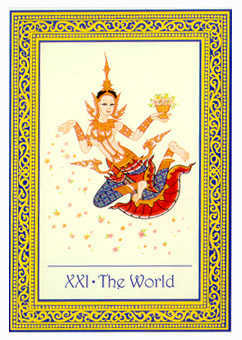 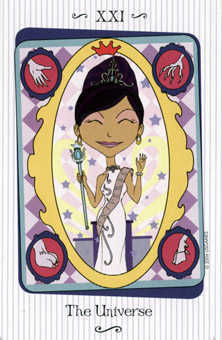 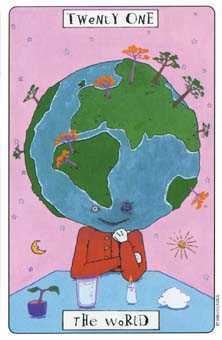 The World card may be giving you permission to do whatever you want. 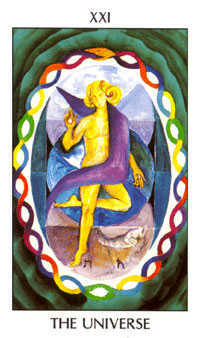 Presently, your motivation is close to the will of the divine. 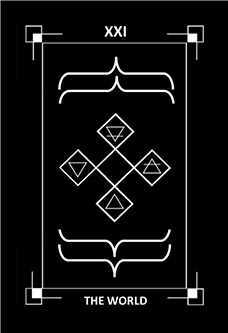 Even if you commit an error, it will be turned to the greater good. 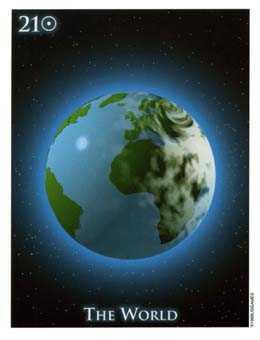 Stay active and just keep moving forward. 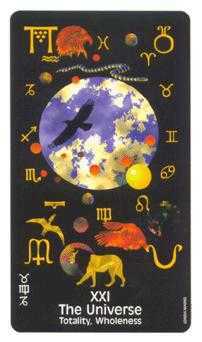 It is unnecessary to keep checking or interrupting your spontaneity with calculation. 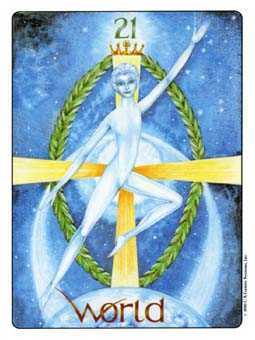 Rather than look for consensus or affirmation from others, simply dance the dance. 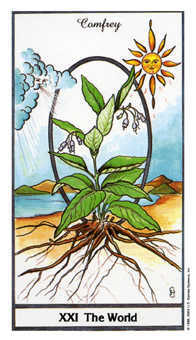 In other words, express yourself, react naturally, and let the chips fall where they may. 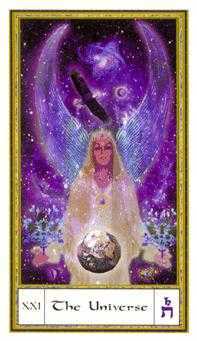 What matters is divine intention. 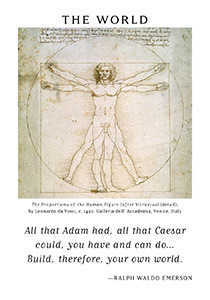 Whether or not human beings approve is less important. 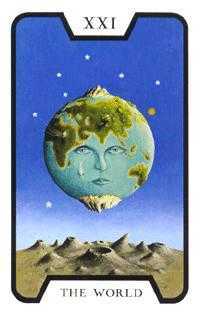 If you allow your ego to inflate, however, you cease to be useful to the greater plan.